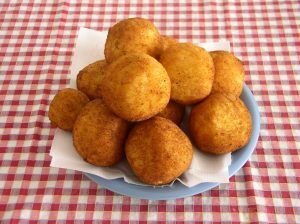 A concoction of corned beef, ham and kraut made into bite-size balls and deep fried to a crisp, golden brown. Melt butter; add onion and cook over low heat 5 minutes. Stir in ham, corned beef and garlic. Cook 10 minutes, stirring occasionally. Blend in 6 tablespoons flour and the egg. Stir in kraut, seasonings and stock. Cook over low heat, stirring occasionally, until thickened. Chill. Shape into walnut-size balls. Thoroughly combine milk and 2-1/2 cups flour; coat balls with this mixture. Roll in bread crumbs. Fry in deep hot fat (375 ) 2 to 3 minutes, or until lightly browned. Drain on absorbent paper. Serve warm on cocktail picks. Note: To Freeze -- Shape kraut mixture into balls; place in freezer container, dividing layers with foil or freezer wrap. Freeze, making sure the container is well sealed. Remove from freezer and partially thaw at room temperature 1 hour before serving time. Increase frying time by about 1 minute.